As Secretary of State Hillary Clinton continues high-level talks with Mexico's leaders this week, her comments about responsibility in the U.S.-Mexico drug trade have struck a chord with officials familiar with U.S. anti-drug efforts. 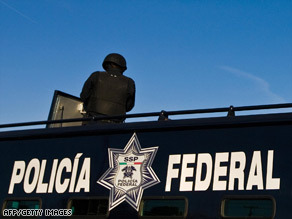 Mexican federal police have been deployed openly in Ciudad Juarez, which borders El Paso, Texas. Clinton said the United States' "inability to prevent weapons from being illegally smuggled across the border" was a major contributor in Mexican violence along the border. She went on to say that the United States has "a co-responsibility." In an interview Wednesday on "American Morning" with CNN anchor John Roberts, former Drug Enforcement Agency special agent Robert Strang talked about the three-pronged approach needed to curb drug use in America and the need to bust distribution rings. Strang is also CEO of Investigative Management Group. Robert Strang, former DEA special agent: Let's face it, the average first drug use is 12 years old in our country. That means kids that are in the sixth grade are trying drugs for the first time. Marijuana, cocaine, heroin, methamphetamine, all these drugs are coming across the border because we demand them. We have the cash to pay for them, and we really are pretty much the No. 1 consumer in the world for these drugs. Roberts: Is the United States doing enough to try to curb demand? The Office of National Drug Control Policy, I don't remember much coming out of it during the Bush administration, and I haven't seen anything come out of it in the Obama administration. Strang: We're trying all the time. I'm on the board for D.A.R.E. America, and that is teaching kids about the dangers of drugs and violence in schools. And constantly, we're trying to get money federally for this program and police officers go into the school. They teach the kids. It's a wonderful program in those trouble years, the fourth, fifth and sixth grade especially, and we need to have a little bit more money in this area. There's three things, John: It's treatment, it's enforcement and it's education. And it's like a three-legged stool. If all three things don't work, it's going to fall down. So, we can send all of the agents in the world down to the border. We can seize all the coke, heroin, methamphetamine that we want. If we don't have treatment on demand, and if we're not educating our kids in our country about the dangers of drugs, the problem's going to grow. Roberts: When you see the Department of Homeland Security prepared to spend these hundreds of millions of dollars on border security, what do you think? Strang: I'm happy that they're doing something. This is a small piece of the enforcement operation. The best thing to do is like the case that we saw three weeks ago, when the DEA announced 750 arrests involving 250 cities between Mexico and the United States, mostly in the U.S., this huge distribution network. Roberts: But would you like to see them take some of that money, and you know, they take, I think, what, $700 million, and they throw it at the border. Would you like to see them take some of that money, maybe even just a fraction of it, and throw it into prevention programs? Strang: Absolutely. Instead of going to some of the financial institutions, I'd like to see it go for the drug problem. I'd like to see enforcement, treatment and prevention. I'd like it to be evenly divided, and I really think we could have an impact on the problem. We've got to look at this a different way. And I think that it's a combination of these things, and we're moving in that direction. Let's hope that we make some headway here.